Airbus’ checkered past has come under examination across a number of jurisdictions, but it may be one of the oldest allegations that brings down CEO Tom Enders. In 2003, Airbus’ defense group—headed up by Enders—sold eighteen Eurofighter Typhoon combat aircraft to Austria. Since then, prosecutors, parliamentary investigators, and the media have gradually confirmed what many suspected at the time: that Airbus distributed bribes and favors to win the contract. From the start, the case known as the “Causa Eurofighter,” or sometimes the “Causa Grasser” after the Austrian finance minister who approved the purchase, has attracted notoriety in Vienna for its implication of high-ranking ministers and businessmen. Yet in the context of newer Airbus bribery allegations ranging from Kazakhstan to Saudi Arabia, the Eurofighter story suggests a much more systemic problem within the marquee European firm. * Airbus (formerly EADS) is a French-German-Spanish company formed from the merger of major aircraft producers in each country in 2000. The Eurofighter Typhoon aircraft is produced as a joint venture by Airbus, BAE Systems (UK) and Leonardo (formerly Finmeccanica) (Italy). Different parts of the plane are produced in the UK, Germany, Spain and Italy, with final assembly lines in each country. (France, and the French portion of Airbus, is not involved in the Eurofighter program). Each partner country also conducts separate marketing and sales of the aircraft. The sale to Austria was negotiated by Airbus Germany. Thomas Enders – CEO of Airbus Group; was during the time of the Austrian Eurofighter deal the head of EADS defense. Named as suspect in Austrian fraud investigation. Karl-Heinz Grasser – Austrian finance minister at time of procurement decision. Widely seen as a key vote in the tender process. Erhard Steininger – arms agent in Vienna who facilitated suspicious payments associated with the Eurofighter deal. Gernot and Erika Rumpold – FPÖ public relations officials. Received a large contract from Steininger at the time of the deal. Erich Wolf – major general of the Austrian Air Force. His wife’s firm received a loan from Steininger at the time of the deal. Frank Stronach – Austrian-Canadian founder of the Magna Group, an auto-parts manufacturer, and supporter of right-wing parties in Austria. Beneficiary of offset arrangements resulting from the Eurofighter deal. Gianfanco Lande – Italian businessman, hired by EADS to manage the Vector Aerospace offset-encouragement scheme. Convicted and sentenced by an Italian court for also operating a Ponzi-scheme. In October 2001, the Austrian government approached aircraft manufacturers for bids to replace its fleet of Saab Draken fighter aircraft. 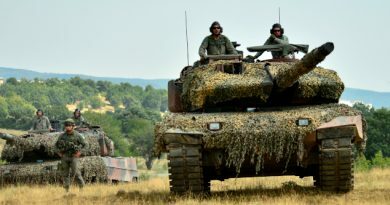 Initially, the Austrians expected to acquire at least 24 units from one of the three finalists: Saab, Lockheed Martin, and the Eurofighter consortium. In July 2002, the government decided to award the contract to the Eurofighter consortium, a joint venture of EADS (now Airbus), BAE Systems, and Alenia Aermacchi (part of Finmeccanica, now Leonardo). 600,000 citizens signed a petition complaining of the cost of the deal—around EUR 1.95 billion—and the government, composed of a coalition between the center- and far-right parties, decided to reduce the order to 18 planes after floods in August 2003 forced a reallocation in government spending. After further criticism and investigation of the deal, a successor center-left government reduced the order again to 15 planes in June 2007, shortly before delivery of the first aircraft, citing EUR 370 million in expected cost-savings. In July 2017, a successor government announced its intention to retire its Eurofighter fleet in favor of a cheaper-to-maintain alternative, although subsequent elections have put plans on hold. Corruption allegations reported in the Austrian press can be grouped into two categories. First, there is a broad suspicion that the former finance minister, Karl-Heinz Grasser of the Austrian Freedom Party (FPÖ), and other decision-makers had benefited their political allies by extracting offset commitments from the competition’s winner. Before entering government in 2000, Grasser was an employee of the Magna Group, a parts supplier to EADS-investor DaimlerChrysler. Magna, founded by the Austrian-émigré Frank Stronach, was tipped to benefit from conditions in the acquisition tender which required the aircraft supplier to arrange investment or supply contracts—known as offsets—worth EUR 4 billion with local firms. At least one Magna official, former manager Hubert Hödl, has as recently as March 2017 been investigated for potential money-laundering charges associated with the offset schemes. Other suspicious offset deals include an EADS investment into a Carinthian technology park and a canceled plan for the aircraft firm to invest in the redevelopment of the retired Spielberg racing track. 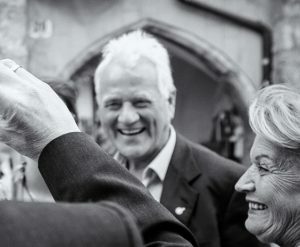 Frank Stronach, founder of Magna International, campaigning for his political party in Innsbruck, Austria, in April 2013. Flickr/Creative Commons, Gerald Streiter. Second, leaks from Austrian and Bavarian criminal investigations and investigations by anti-corruption activists such as former-Green party parliamentarian Peter Pilz, also reported in the Austrian press, have cast light on more specific allegations of direct bribery by EADS in relation to the aircraft tender. The primary agent identified in these reports is Erhard Steininger, a Vienna-based lobbyist for EADS, who gave a loan of EUR 87,600 to the wife of Austrian Air Force Major General Erich Wolf and administered a EUR 6 million contract to the advertising firm of Gernot and Erika Rumpold, allies of FPÖ chief Jörg Haider. Documents seized from EADS offices in Bavaria also suggest that the company had implausibly high visibility into the decision-making process for the tender. In subsequent years, further leaks and court proceedings added to the base of allegations against EADS and the Austrian government. The Austrian intermediary Alfons Mensdorff-Pouilly, a key suspect in a separate bribery investigation involving the sale of Saab’s Gripen to the Czech Republic and Hungary, was reportedly commissioned by BAE, Saab’s marketing partner, to secure the Austrian tender for the Gripen as well. However, Mensdorff-Pouilly later acted as an intermediary for certain EADS payments marked as offset investments which ended up, via offshore accounts, in unknown hands. In 2011, another EADS associate, Gianfranco Lande, was tried and sentenced to seven years in prison by the Italian courts for operating a Ponzi-scheme targeted at wealthy families and celebrities. In the course of the trial, Lande’s role as the manager of Vector Aerospace, an entity created by EADS to promote offsets for the Austrian deal, was widely publicized in the Italian press. According to Italian investigators, Lande received EUR 84 million from EADS to secure commitments from Italian firms to invest in Austria that EADS could credit towards its offset obligations. Lande claimed that some of that money was used to pay investors in his Ponzi-scheme, but investigators in Munich were later reported to be building a case that the Vector money was used as a general bribe-fund. In November 2012, officials from the Munich public prosecutor’s office raided EADS buildings in Germany. German magazine Spiegel reported that month up to EUR 113.5 million had been distributed by EADS through Vector into a range of letter-box firms, some created using stolen identities. The annual reports to EADS from one such letter-box firm, the London-based City Chambers, indicate that the firm organized meetings in Vienna in 2002 and 2003 with Austrian military officials and cabinet ministers (logged under pseudonyms), including possibly Schüssel, Haider, and Grasser. For this service, City Chambers was paid EUR 8 million between 2003 and 2009. Elections in 2006 produced a change in government, with a center-left-led coalition removing conservative (ÖVP) Chancellor Wolfgang Schüssel. With support of other parties and under pressure from the Austrian Greens, the new government of Alfred Gusenbauer of the Social Democratic Party of Austria (SPÖ) authorized a parliamentary investigation into whether the contract could and should be modified or terminated. The parliamentary investigation did not produce a consensus or even majority report, with the different party factions writing their own findings. However, the committee did identify many suspect transfers between Steininger, EADS, and various politically connected persons. An independent legal assessment requested by the investigation determined that Austria could use the Steininger payments as justification to withdraw from the Eurofighter contract entirely. In June 2007, however, Norbert Darabos, the new SPÖ defense minister, decided that the contract would be shrunk, rather than eliminated. A second parliamentary inquiry in 2017 would later claim that Darabos’ renegotiation had resulted in Eurofighter providing older aircraft with unsustainable maintenance costs. In February 2017, following an internal defense ministry investigation into the purchase, the Austrian government filed a civil suit against Airbus alleging up to EUR 1.1 billion in damages due to misleading information on the price, deliverability, and equipment of the interceptors. Two months later, Austrian prosecutors named EADS (which in 2013 was rebranded as the Airbus Group) CEO Thomas Enders as a person of interest—one of sixteen—in a fraud investigation related to the Eurofighter deal. According to a report based on leaked internal EADS documents, Enders had knowledge in the early 2000s of the elaborate payments-scheme built around Vector Aerospace to manage offset payments associated with the deal. The French government, a shareholder in Airbus, began calling for Enders’ replacement, and in December 2017 Enders announced plans to step down—but not until March 2019. A separate investigation by prosecutors in Bavaria, where the Eurofighter consortium is based, is ongoing although no indictments have yet been issued. 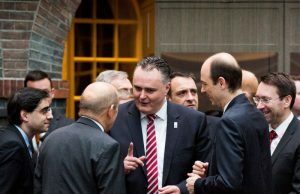 Austrian Minister of Defense Peter Doskozil confers with other defense ministers at an informal meeting in Amsterdam, Feb. 5, 2016. Flickr/Creative Commons, EU2016 NL. Austria announced a decision in July 2017 to retire its Eurofighter fleet in favor of a cheaper-to-maintain alternative, with SPÖ defense minister Peter Doskozil claiming that the country had been misled by EADS about the benefits of offsets. With elections in October 2017 returning a right-wing ÖVP-FPÖ coalition, however, it is unclear whether the new government will pursue Doskozil’s plan, follow-up on the incomplete findings of the second parliamentary investigation, or press the civil suit against Airbus. Update (July 19, 2018): In February 2018, the German investigation into Airbus was terminated by a settlement whereby Airbus was fined EUR 81.25 million. Prosecutors in Munich were unable to prove bribery, but did establish that Airbus was unable to account for EUR 100 million in payments to shell companies in the United Kingdom. The Austrian investigation remains ongoing, and its findings have been shared with other interested jurisdictions, including the United States. Image Caption: Members of the Austrian parliament brief the press at the close of the second parliamentary inquiry into the Eurofighter deal in September 2017. Image Source: Parlamentsdirektion / Thomas Topf. “Der Stronach-Fighter,” Der Standard (online), July 3, 2002, http://derstandard.at/999933/Der-Stronach-Fighter. Dominik Baur, “Herr Stronach kauft sich Österreich,” Der Spiegel (online), July 4, 2003, http://www.spiegel.de/wirtschaft/polit-filz-herr-stronach-kauft-sich-oesterreich-a-255619.html. “Das war der Eurofighter-U-Ausschuss,” Die Presse (online), July 1, 2007, https://diepresse.com/home/innenpolitik/eurofighter/314181/Das-war-der-EurofighterUAusschuss. “Eurofighter-Untersuchungsausschuss hat seine Arbeit beendet 48 Sitzungen, 108 Zeugeneinvernahmen, mehr als 6.000 Seiten Protokoll,” Austrian Parliament Press Release, July 4, 2007, https://www.ots.at/presseaussendung/OTS_20070704_OTS0183/eurofighter-untersuchungsausschuss-hat-seine-arbeit-beendet-48-sitzungen-108-zeugeneinvernahmen-mehr-als-6000-seiten-protokoll. “Gli affari austriaci del Madoff dei Parioli,” Il Giornale (online), June 2, 2011, http://www.ilgiornale.it/news/affari-austriaci-madoff-dei-parioli.html. Gerrit Wiesmann and Carola Hoyos, “EADS offices raided in bribery probe,” Financial Times (online), Nov. 7, 2012, https://www.ft.com/content/7455ff4e-28fe-11e2-9591-00144feabdc0. “Investigation into Dubious EADS Austria Deal Intensifies,” Der Spiegel (online), Nov. 12, 2012, http://www.spiegel.de/international/business/investigation-into-dubious-eads-austria-deal-intensifies-a-866646.html. Jörg Schmitt and Gerald Traufetter, “New Allegations Haunt EADS Fighter Jet Deal,” Der Spiegel (online), Dec. 17, 2012, http://www.spiegel.de/international/business/new-allegations-haunt-eads-fighter-jet-deal-a-873194.html. Klaus Ott, “Eurofighter-Treffen in der Milchbar,” Süddeutsche Zeitung (online), Feb. 20, 2014, https://www.sueddeutsche.de/wirtschaft/schmiergeld-verdacht-gegen-eads-eurofighter-treffen-in-der-milchbar-1.1893747. Peter Pilz, “Tagebuch, Juni 2014, Eurofighter – Die Anzeige,” blogpost, June 2014, http://peterpilz.at99.at/2014-6/peter-pilz-tagebuch.htm. Gwyn Topham, “Serious Fraud Office starts Airbus inquiry,” The Guardian (online), Aug. 7, 2016, https://www.theguardian.com/business/2016/aug/07/uk-office-launches-inquiry-into-airbus-deals. “Chronologie: Der Weg der Eurofighter nach Österreich,” Die Presse (online), Feb. 16, 2017, https://diepresse.com/home/innenpolitik/5170499/Chronologie_Der-Weg-der-Eurofighter-nach-Oesterreich. Tim Hepher and Cyril Altmeyer, “Update 2-After UK, France opens probe into Airbus jet deals,” Reuters, Mar. 16, 2017, https://www.reuters.com/article/airbus-group-france-investigation/update-2-after-uk-france-opens-probe-into-airbus-jet-deals-idUSL5N1GT6V6. Kirsti Knolle, “Exclusive: Austria investigates Airbus CEO over suspected fraud,” Reuters, Apr. 26, 2017, https://www.reuters.com/article/us-airbus-group-austria-inquiry-exclusiv/exclusive-austria-investigates-airbus-ceo-over-suspected-fraud-idUSKBN17S1MO. “Airbus faces lengthy probe, no quick fine: sources,” Reuters, Sep. 15, 2017, https://www.reuters.com/article/us-britain-france-sfo/airbus-faces-lengthy-probe-no-quick-fine-sources-idUSKCN1BQ22K. David Pegg and Rob Evans, “Airbus launches internal corruption investigation after Guardian exposé,” The Guardian (online), Sep. 18, 2017, https://www.theguardian.com/business/2017/sep/18/airbus-launches-internal-corruption-investigation-after-guardian-expose. Kirsti Knolle, “Airbus challenges Austrian allegations over Eurofighter deal,” Reuters, Sep. 18, 2017, https://www.reuters.com/article/us-airbus-austria-lawsuit/airbus-challenges-austrian-allegations-over-eurofighter-deal-idUSKCN1BT120. Martine Orange, Yann Philippin, and Lea Fauth, “Corruption: les documents qui accusent le patron d’Airbus,” Mediapart (online), Oct. 6, 2017, https://www.mediapart.fr/journal/economie/061017/corruption-les-documents-qui-accusent-le-patron-dairbus. “Airbus ordered to pay €81 million to end German corruption probe,” DeutscheWelle (online), Feb. 9, 2018, https://www.dw.com/en/airbus-ordered-to-pay-81-million-to-end-german-corruption-probe/a-42526129. Kirsti Knolle, “Austria hands findings on 2003 Eurofighter purchase to U.S.,” Reuters, Feb. 12, 2018, https://www.reuters.com/article/us-airbus-nl-eurofighter-austria/austria-hands-findings-on-2003-eurofighter-purchase-to-u-s-idUSKBN1FW1WV.